Modular smart home developer Project Etopia has opened a new factory capable of producing 2,000 houses a year. The factory’s output will help complete London’s first modular commuter village being constructed by Etopia in Corby, Northamptonshire. 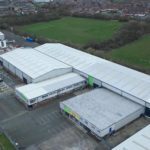 The 50,000 sq ft factory in Ellesmere Port, Cheshire, is a collaboration with partner company 4wall — the producer of a panelised construction system — and can produce five three-bedroom homes per day. There are already plans to scale up the facility in the future with the addition of two more machines, which would grow capacity to 6,000 units per year. The opening of the factory will create 120 new full-time jobs in 12 months, and 250 within two years. 4wall’s insulated panels can handle up to 400mph winds and can be built to different size specifications depending on the project. Building Regulations for new homes require the thermal insulation U-value of 0.16. The lower the U-value, the greater the thermal efficiency, and 4wall panels have a U-value of 0.13. The factory’s plant machinery allows for a continuous line production process that can create tens of thousands of panels of different sizes under enormous heat and pressure. A 110 sq/m shell made up of lightweight 97kg panels can be constructed by three people in eight hours and they can be stacked up to 14 storeys high. Joseph Daniels, CEO of Project Etopia, commented: “This is an exciting and important milestone for us that will help us achieve our ambition to produce 21,500 eco-modular homes by 2025. This is a critical time for housebuilding in the UK with homes still not being built quickly enough, locking millions of people out of the property market.